"Warm Bodies" may not look like a film worth watching but it is. It might seem that it has the perfect elements for failure but it actually doesn't. 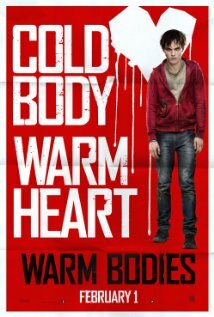 What "Warm Bodies" brings into the table is one that brings new life into a genre that seems all-too-generic for the longest time already. Zombies, romance and comedy all mixed in one package - who knew a weird and quirky combination could turn out to be oh-so-good? The apocalypse has happened and almost all humans have turned into zombies or worse. A zombie named R (Nicholas Hoult) wanders around an abandoned airport. When he becomes hungry, he, his best friend zombie named M (Rob Cordry) and a few other zombies wander into the city to look for humans to eat. They stumble upon a group of humans who are recovering some medical supplies. When R sees Julie (Teresa Palmer), he instantly falls in love and decides to help her escape from sure death. He takes her to his home inside an abandoned airplane and shows Julie that zombies actually have thoughts and emotions - they just don't have the capability to show it. As the two bond more and more, things start beginning to change inside R. Is this the start of something that can completely save humanity? "Warm Bodies" is about zombies through and through but it never feels old. In fact, it feels new and it completely injects never-before-seen elements into the genre. Zombies here still feed on humans but they actually do this to survive. Well not the animalistic, mindless way we always see zombies as but they do this with remorse and even regret. They eat brains for example to "dream" and "feel" human again and to make sure that the human they eat don't become one of them - beings whose emotions and feelings are trapped within a body that seems emotionless and heartless. These are only some of the elements that make "Warm Bodies" special. The magic formula is it humanizes zombies. And while we really don't buy the "cure", it fits perfectly in a romance comedy scenario. The movie also features a witty and humor-filled dialogue mostly brought by Nicholas Hoult's narrative voice. We found ourselves laughing countless times as he tries to swoon over Julie. Acting wasn't special though but it's good enough. What we didn't like about "Warm Bodies" though is its penchant to not make sense at times. R, for example, suddenly learns to run, to drive and to even speak in sentences. While it may be because of the "cure" working its way into R's body, the movie never clearly explains that. At times, we just found some elements weird and off-putting. Nonetheless, that's a very minor setback to an overall great and funny experience.